Raspberry Pi User Guide, 4th Edition is the ”unofficial official” guide to everything Raspberry Pi 3. Written by the Pi’s creator and a leading Pi guru, this book goes straight to the source to bring you the ultimate Raspberry Pi 3 manual. This new fourth edition has been updated to cover the Raspberry Pi 3 board and software, with detailed discussion on its wide array of configurations, languages, and applications. You’ll learn how to take full advantage of the mighty Pi’s full capabilities, and then expand those capabilities even more with add-on technologies. You’ll write productivity and multimedia programs, and learn flexible programming languages that allow you to shape your Raspberry Pi into whatever you want it to be. If you’re ready to jump right in, this book gets you started with clear, step-by-step instruction from software installation to system customization. The Raspberry Pi’s tremendous popularity has spawned an entire industry of add-ons, parts, hacks, ideas, and inventions. The movement is growing, and pushing the boundaries of possibility along with it are you ready to be a part of it? This book is your ideal companion for claiming your piece of the Pi. Get all set up with software, and connect to other devicesUnderstand Linux System Admin nomenclature and conventionsWrite your own programs using Python and ScratchExtend the Pi’s capabilities with add-ons like Wi-Fi dongles, a touch screen, and more The credit-card sized Raspberry Pi has become a global phenomenon. Created by the Raspberry Pi Foundation to get kids interested in programming, this tiny computer kick-started a movement of tinkerers, thinkers, experimenters, and inventors. Where will your Raspberry Pi 3 take you? 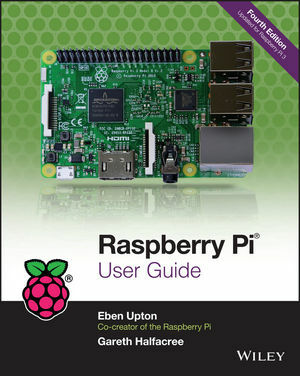 The Raspberry Pi User Guide, 3rd Edition is your ultimate roadmap to discovery.